Would you say that the soups have enough nutrition to continue someone’s active lifestyle or workout routine? Definitely! I wouldn’t have it for breakfast lunch and dinner, but having a bowl of soup supplemented with healthy sides or snacks is a perfect replacement for one meal a day especially when it comes to dinner. The soups are so satisfying and filling. It’s all about balance and incorporating healthier choices. If I plan ahead and have healthy snacks like almonds or fresh fruit, as opposed to quick and easy sugary snacks, I am more energized and less likely to cheat. If you make that change you will absolutely see the pounds fall off and feel great. It’s really that easy! That’s awesome. Have you incorporated any of the soups in a favorite recipe? Of course, in fact, I just tried experimenting with a soup in a pasta bake on Sunday afternoon and it turned out great! These soups are definitely designed to help create delicious recipes. All of the contestants have touching stories about their own journey, so at the end of the day, I am sure everyone is going to feel like a winner. Is there anyone in particular who has touched you? I wish there were 50 winners to be honest! Who wouldn’t want to be whisked away to LA, have a total makeover experience, then get to go to E! Fashion Police. It’s totally a rewarding scenario. We had over 4,000 women enter the contest and we are down to 6 right now. These are all inspiring ladies that work hard and hit the pavement every day. They are such giving individuals and I am such a believer in giving back to people like that. I believe that every single female deserves to have that special time and opportunity to be pampered. That is what makes this Progresso contest so cool. Everyone can vote right now until April 10th. Three winners will be announced on the April 14th. Win or lose, do you agree that all of the contestants’ family and friends have been inspired by their efforts? Yes. I believe we should all help lift each other up when we’re down. That compassion can be contagious, which is the beautiful part of the contest. This contest will celebrate three women, but after all is said and done and the winners go home, they are going share their experience with their friends, cousins, mothers and daughters; making our message infectious! I believe healthy living has enormous power, and for each of us that make the personal choice to be responsible for our bodies, and to make the right choices, it’s only going to have a triple affect. What does the future hold for you, do you have any new projects in the works? I am launching a new website called thecattwalk.com, where I share some of my experiences during red carpet events and the award season. It’s actually a blog meets a website where I have my “cattfirmations,” which are daily inspirational messages for my readers. Now people will be able to see fashion, beauty and lifestyle all in one place! 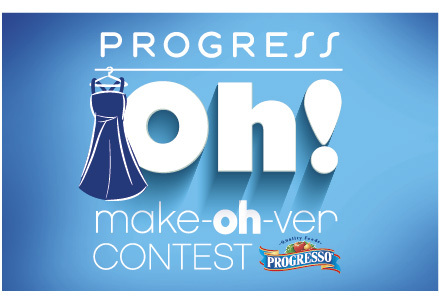 The finalists and their stories can be viewed at Progresso.com/ProgressOh where fans can vote for their favorite, most inspiring stories! Progresso is always cooking up cool new contests so who knows…there might be something down the line for you to participate in! Until then you might want to grab yourself a spoon because with 40 soups under 100 calories per serving, it’s never been easier to beat the dreaded diet doldrums, while sticking to your weight management goals.